Our next social ride out of Burnie on Sunday 28 April will be your choice: an easy cruise taking in the coast or a more challenging 35 km loop through Stowport. Both groups will meet at the Burnie Yacht Club before 11 am. People wanting a shorter, easier ride will head to Sulphur Creek via the highway, return along the partial bike path and then choose whether to head to Fern Glade and back. The other group will head through Fern Glade to Stowport before deciding whether to continue along Glance Creek to Upper Stowport Road, or Upper Stowport Road to Natone Road. The return trip will be via Stowport or Minna Road, it’s up to the group. The longer loop is about 36.6 km in length and climbs about 556 metres. Both groups will come together at the end of the ride for lunch at the Burnie Yacht Club. 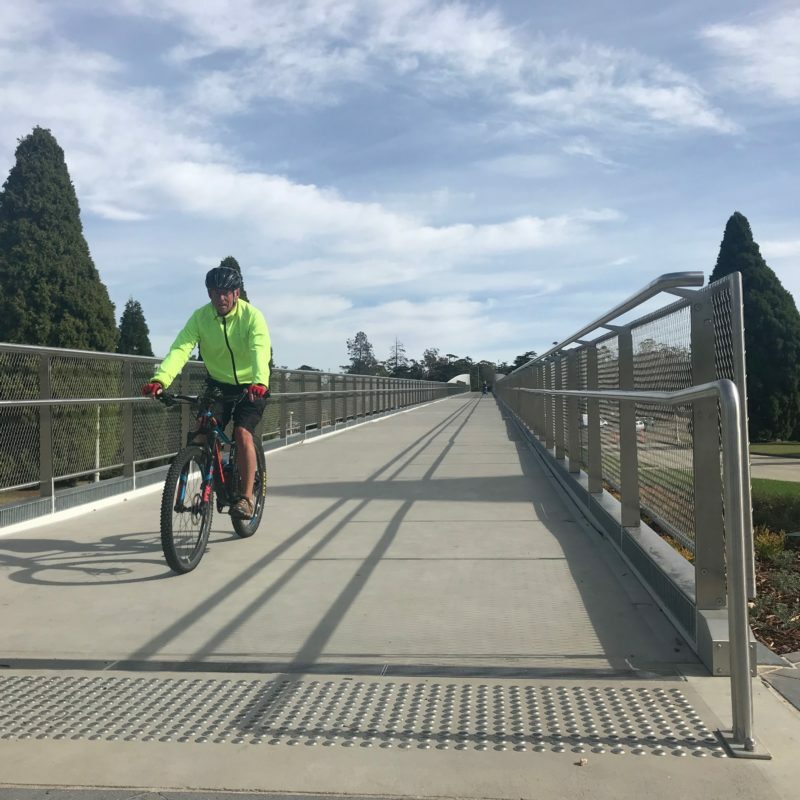 There’s a new bridge and short bike path in Hobart, and if you haven’t tried them out yet we’ve got a ride for you with views fit for a queen on Wednesday 1 May. A short 10 km route with a little bit of climbing (113 metres), this is an exploratory trip for those who don’t know what the Domain and waterfront has to offer for cycling. We’ll use the new Remembrance Bridge to head to the Queens Domain to test the unsealed Soldiers Walk and Joggers Loop. And there’s a smooth new path through the Macquarie Point site which provides an alernative to the start/end of the Intercity Cycleway. Meet outside Brooke Street Pier on Franklin Wharf at 9.45 am for a 10 am start. At the end of the ride, we’ll gather at Salamanca Place for a coffee. These rides are being offered as part of Bicycle Network Tasmania’s social rides program. Social rides are free and organised by volunteers to help riders meet new people, learn new skills and gain confidence on their bikes. Social rides are featured in each edition of In the Loop, but if you want more notice visit our social rides calendar, which is regularly updated. The strength of our social rides program depends on members volunteering to lead rides. Leading social rides is a fun way to "give back" to the riding community, and to help us to get "more people riding, more often". Bicycle Network Tasmania accredits Social Ride Leaders, and requires anyone interested in leading rides to be accreditted. If you would like to be one of our Ride Leaders, please volunteer here and we'll let you know when the next Ride Leader Skills Development Workshop is scheduled.